My kids (and their friends) are growing and streeeetching out, and along with that comes daily exploration and constant testing of their bodies' capabilities. In this case... how high they can climb! Pictured on the higher level are the neighbors. My little guy is below, but you know he's watching closely and biding his time! 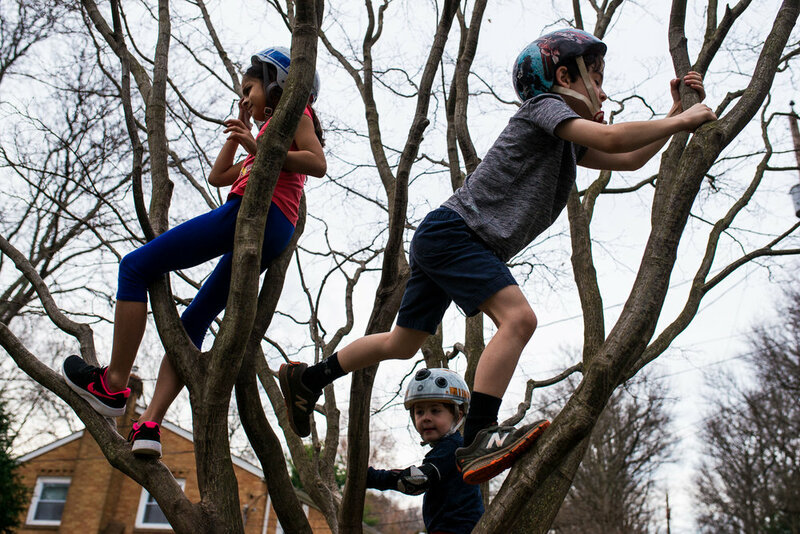 I wanted to make a storytelling image of the kids climbing this tree because it's something they do all the time. The only problem is that behind the tree are houses and cars and they make for a lot of visual noise that compete with the limbs of the tree (not to mention limbs of the children). For that reason I got low and shot upwards in order to get a cleaner canvas behind the tree. After that, it was a matter of waiting until the little climbers moved into a position where I could see all three of them. When the child on the top right took a step onto the other branch, I knew I had my shot. I only had to reposition myself just a little in order to compose the shot this way. I hope the tree can hold them a little longer, because shooting it is as much an adventure for me as it is for them! Now swing on over to Taiwan and read about Rebecca Hunnicutt Farren's storytelling image!